Although today’s card is actually widely feared and misunderstood – I find it to be one of my personal favorites. The infamous “Death” card with the hooded reaper seems ominous – but in fact it speaks of transition rather than finality or tragedy. Think of times in your life where an ending led to a fresh start that dramatically improved your life. This card often comes up for renewal after a challenge or a new beginning after something ends. This is the most feared and most widely misunderstood card in a Tarot Deck. 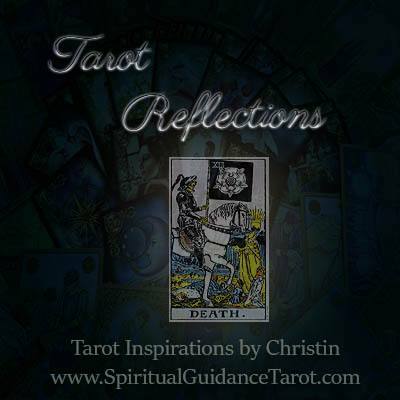 The Death card does indicate a time of great changes being present. It also indicates leaving the past behind to start fresh, or to find new opportunities designed to further you in a different direction. It speaks of transition rather than final endings. When this card comes up, it always indicates a period of progress. Sometimes this process can be painful at first. It’s hard to leave behind what we have come to know, but without change, growth wouldn’t be possible. In order to fly, a newly formed butterfly must struggle to break free from its cocoon. The struggle strengthens its wings. Without that struggle, the wings shrivel and the butterfly dies without ever experiencing the freedom of flight. Sometimes we remain in “comfort zones” simply because they are familiar, although they offer us no place to stretch our wings. Sometimes life has a way of shaking things up when we need to get moving. The Death card speaks of these types of changes. The Phoenix bird is a good way to view this card. Be like this legendary bird and rise up out of your own ashes to begin again. Regeneration and a new way of life are possible, look for the hidden opportunities. Our biggest challenges give birth to our greatest achievements because we find out what we are really made of. Now is a good time to restore your faith in God/The Universe, and yourself. Embrace change because it is inevitable and with it comes opportunity; without it comes a lack of true living – or “death”. What do I need to sacrifice to reach my fullest potential? Has resisting change been holding me back? How can I best to adapt to current changes to make the most of the situation?